NOTE: All Digital Services are available with a library card and are free of charge. Browse through some of these titles and others to download into your computer or devices. 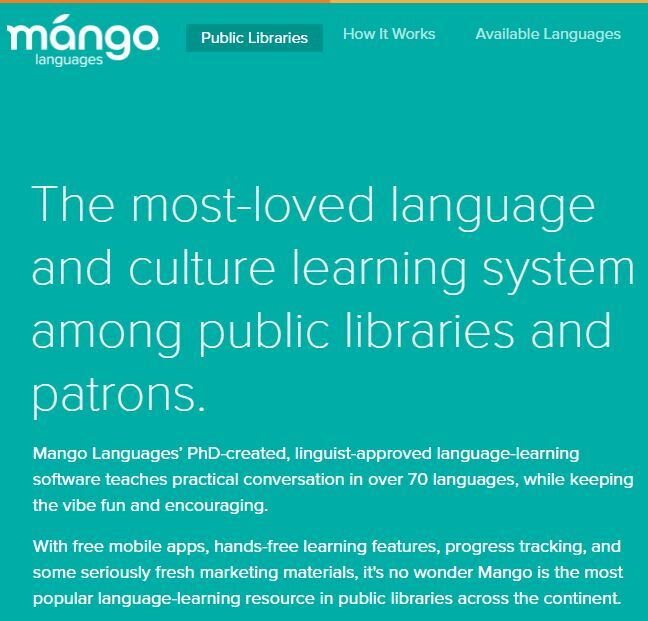 Mango Languages provides a self-paced learning program that teaches languages through unique methodology features content and exercises crafted by expert linguists and language teachers that empower learners to comprehend, construct, and create conversations in the real world. ​BookBub features limited-time offers for the best free books in over twenty genres, from both top-tier publishers and critically-acclaimed independent authors. This site offers over 29,000 free eBooks with a wide range of genres, both fiction and non-fiction. Over 39,000 free eBooks that are compatible with different devices. Download them or read them online.